People are living longer and healthier lives1. Older adults also are more likely to keep their teeth for a lifetime than they were a decade ago. However, studies indicate that older people have the highest rates of periodontal disease2 and need to do more to maintain good oral health. Oral health is not just important for maintaining a nice-looking smile and being able to eat. Good oral health is essential to quality of life. Every tooth in the mouth plays an important role in speaking, chewing and in maintaining proper alignment of other teeth. People with dentures or loose and missing teeth often have restricted diets since biting into fresh fruits and vegetables are often not only difficult, but also painful. This likely means they don’t get proper nutrition. It’s important to keep your mouth clean and healthy, and it’s important to know the state of your periodontal health. Receding gum tissue affects the majority of older people. In gingival recession, the gingival margin has migrated apically and that the root surface has become exposed and sensitivity may result. Teeth become sensitive to hot and cold or to sweet, sour, or spicy foods. 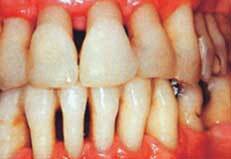 Teeth may also appear longer than normal .Spaces between teeth seems to grow but actually the space is the same but it seems larger because the gums do not fill it any more. Gingival recession usually occurs due to periodontitis (The inflammatory process, initiated and maintained by microorganisms, degrade the gingival connective tissue and alveolar bone), tooth brushing trauma which causes the enamel at the gum line to be worn away by scrubbing the sides of the teeth in a washboard fashion and following treatment of periodontitis with oral hygiene instruction and debridement. Recent research has advanced the idea that periodontal disease is linked to a number of major health concerns such as heart disease3, stroke, respiratory disease and diabetes4. Anatomical and functional changes in periodontal tissues have been reported as being associated with the aging process5. While the likelihood of developing periodontal disease increases with age, research suggests that these higher rates may be related to risk factors other than age. 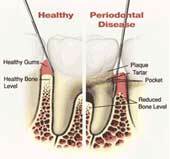 So, periodontal disease is not an inevitable aspect of aging6. Risk factors that may make older people more susceptible include general health status, diminished immune status7, medications7, depression8, worsening memory9, diminished salivary flow10, functional impairments11 and change in financial status. Older adults are likely to take medications that can impact oral health and affect dental treatment. Medications (including anti-histamines, diuretics, pain killers, high blood pressure medications and anti-depressants) can cause side effects such as dry mouth10, soft tissue changes, taste changes, and gingival overgrowth7. 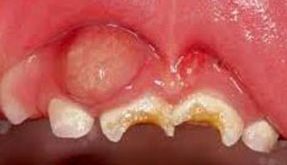 Gingival overgrowth is aggravated by poor oral hygiene. 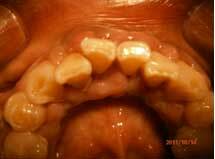 Gingival overgrowth due to high blood pressure medication aggravated by poor oral hygiene. Dry mouth leaves the mouth without enough saliva to wash away food and neutralize plaque, leaving you more susceptible to tooth decay and periodontal disease. There are various methods to restore moisture, including sugar gree chewing gum, oral rinses or artificial saliva products. Recent studies suggest that estrogen deficiency could place post-menopausal women at higher risk for severe periodontal disease and tooth loss12. Hormonal changes in older women may result in discomfort in the mouth. These include dry mouth, pain and burning sensations in the gum tissue and altered taste, especially salty, peppery or sour. Gums that look dry or shiny bleeds easily. Most women find that estrogen supplements help to relieve these symptoms. Bone loss is associated with both periodontal disease and osteoporosis13. Osteoporosis could lead to tooth loss because the density of the bone that supports the teeth may be decreased. Women considering Hormone Replacement Therapy (HRT) to help fight osteoporosis should note that this may help protect their teeth as well as other parts of the body. Denture wearers need to avoid plaque build up that can irritate the tissues under the dentures. Clean your dentures after meals and remove dentures at night to avoid bacteria growth. If you wear dentures, you need to see a dental professional regularly. Because your mouth continues to undergo changes, dentures need to be checked regularly to ensure they are fitting correctly. This is to avoid irritation, bone loss and infections. A change in the fit of partial dentures could indicate periodontal disease. It is especially important to practice a meticulous oral health care as you age. Receding gum tissue affects a large percentage of older people. This condition exposes the roots of teeth and makes them more vulnerable to decay and periodontal infection. You must remove the plaque from your teeth and gums every day with proper brushing and flossing. Regular dental visits are also important. Daily cleaning will help keep calculus formation to a minimum, but it won’t completely prevent it. A professional cleaning at least twice a year is necessary to remove calculus from places your toothbrush and floss may have missed. Ellen RP. Periodontal disease among older adults: what is the issue? Periodontol 2000 1998;16:7-8. Paquette DW, Brodala N, Nichols TC. Cardiovascular disease, inflammation, and periodontal infection. Periodontol 2000. 2007; 44: 113-26. Novak MJ, Potter RM, Blodgett J, Ebersole JL. Periodontal disease in Hispanic Americans with type 2 diabetes. J Periodontol. 2008; 79: 629-36. Van der Velden U. Effect of age on the periodontium. JClin Periodontol 1984;11:281-94. Burt BA. Periodontitis and ageing: reviewing recent evidence. J Am Dent Assoc 1994;125:273-9. Kinane DF, Marshall GJ. 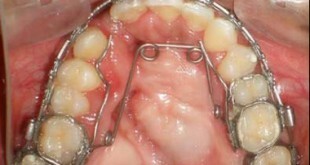 Periodontitis modified by systemic factors. Ann Periodontol. 1999; 4: 54-63. Rosania AE, Low KG, McCormick , Rosania DA. Stress, depression, cortisol, and periodontal disease. J Periodontol. 2009; 80: 260-6. Yu YH, Kuo HK. Association between cognitive function and periodontal disease in older adults. J Am Geriatr Soc. 2008; 56: 1693-7. Nagler RM, Hershkovic O. Relationships between age, drugs, oral sensorial complaints and salivary profile. Arch Oral Biol. 2005; 50: 7-16. Einarsdóttir ER, Gunnsteinsdóttir H, Hallsdóttir MH, Sveinsson S, Jónsdóttir SR, Olafsson VG et al. Dental health of patients with Parkinson’s disease in Iceland. Spec Care Dentist. 2009; 29: 123-7. Lerner UH. Inflammation-induced bone remodeling in periodontal disease and the influence of post-menopausal osteoporosis. J Dent Res. 2006 Jul;85(7):596-607. Vishwanath SB, Kumar V, Kumar S, Shashikumar P, Shashikumar Y, Patel PV. Correlation of periodontal status and bone mineral density in postmenopausal women: A digital radiographic and quantitative ultrasound study. Indian J Dent Res. 2011 Mar-Apr;22(2):270-6.